Laws and regulations involving stone walls are a patchwork. New Hampshire, Massachusetts, and Connecticut have all revised their laws regarding stone walls. If you (the reader) know of other state laws, or have an update, please contact the SWI. Rhode Island: Link to Title 45 and Title 11 , and Tax Exemption. (Courtesy of July Lewis, Policy Assistant, Audubon Society of Rhode Island). New Hampshire: Link Here for article on legislation signed into law in August, 2009. Towns are making ordinances as well. Consult the historical commission or historical society for the town in question. 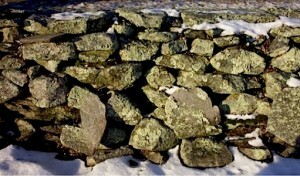 For an example from Smithfield Rhode Island, link to stone wall ordinance. Lichen-cover on graveyard wall. Can you “Where’s Waldo?” the broken gravestones?